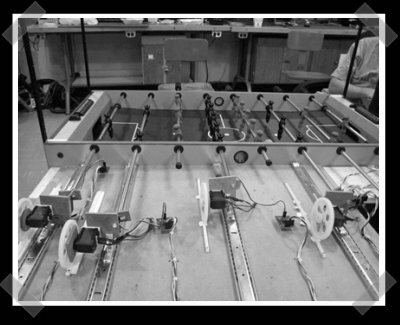 [Shane ] sent in GATech’s senior design final projects, but his Autonomous single player foosball table is awesome. A Java app tracks player and ball via webcam. Then it acts as the opposite player by controlling servo actuated paddles. He’s copied his project to his personal server, just in case the class files get pulled next semester. The course page is pretty ugly, but the project pages aren’t. It’s worth some time to check out the rest of the projects. The 2d iRobot based mapping system looks interesting, but lets be honest, the hand washing detector should be mandatory federal equipment at every fast food restaurant. This is a nice hack. More like this. It would be greatly improved if he were to use faster/stronger stepper motors instead of small servos, and build the control into the table rather than doubling the size. At last! Someone who plays foosball worse than me. I don’t feel justified in commenting about the mechanical performance of the setup, as they address those concerns (mostly by the fact that they aren’t mechanical students :P). As a whole, that’s pretty inspirational. I’d figure the fps rate of the webcam has to be bloody high. I couldn’t even see where the ball was heading when I started playing. those are only proposals as far as i can see.. so this means the projects are to be completed within the following semester? if so, there are some badass proposals there and i would love to see what they come up with.. gatech is a great school and i’m sure they will find a way to impress.. I just graduated from Georgia Tech’s Electrical Engineering program and the senior design class is only a one semester class. You have to present a proposal by the second week of class, followed by a mid-semester review of the project. By the end of finals week you need to demonstrate to the professor the functionality in the proposal and provide a final report. All in one semester. They work you hard at GT. The webcam was bought with the intention of it being 90fps but was actually 30max and had to be reduced further to 15fps for the resolution they needed. Very nice work given the constraints of mechanics and money! I was recently at GT and will (hopefully) be attending GATech next semester, during a tour of the EE lab I saw this project and was very impressed by it (even though it was not working or even assembled fully at the time). I wonder why they were getting 15fps max at 320×240. My cheap logitech cam will do 28/29 at the same res. Handwashing detection… heh, McDonalds would be screwed. Nobody washes their hands as often as they’re legally required to (a bell goes off every X minutes… and nobody moves). Interesting,,, however this project was done for senior design a few years ago at UIUC. I was in the lab a few days ago and saw almost exactly the same thing – except it used stepper motors.